White-Nose Syndrome is leading to a high mortality rate in little brown bats. Bats are the only mammals that are naturally capable of flying for any length of time. When they fly into our New England homes they are considered pests, but in nature, they are effective at regulating populations of insects that cause us so much trouble. Throughout the world, bats are known for being very beneficial mammals; they help with pollinating flowers and dispersing fruit seeds. In the U.S., we have between 45 and 48 species of bats, with the 3 most common species being the little brown bat, the big brown bat and the Mexican free-tailed bat. In Modern’s New England service area, we mostly see the little brown bat and the big brown bat. Unfortunately, bat numbers have been on the decrease over the past 7 years or so, ever since the white-nose syndrome that is affecting these creatures was discovered in New York in February of 2006. What is White-Nose Syndrome (WNS)? The disease that is affecting bats is poorly understood at this time, but it is believed to be caused by a distinctive white fungal growth that has been found around the muzzles and on the wings of hibernating bats. Since it was found in 2006, it has been identified in more than 115 caves and mines throughout the Northern U.S. and as far south as Alabama. It has even been found in at least four Canadian provinces. Mortality rates for this disease are believed to be at 95%, which means it has become devastating to bat populations. The disease itself causes bats to rouse during their torpor, or temporary hibernation. They become too active and as a result, their energy is drained and they starve to death. WNS symptoms include unusual winter behavior that includes flying, damage and scarring of their wing membranes as well as loss of body fat and then ultimately, death. If this disease should go untreated, some experts believe that with low bat birth rates (only about one offspring per year), the little brown bat, which was once quite common, could be extinct in 20 years time. There are studies being conducted to see what can be done to save these species, even testing with common anti-fungal treatments that humans have used, but at this time, more studies are being undertaken to determine the best possible treatment for WNS. Although a problem when you have bats in the attic or when they accidentally fly through your back door, they serve an important role in nature. With White-Nose Syndrome spreading quickly across the U.S., these bats may be facing extinction, so there are federal and state laws that prohibit the killing of bats. Since baby bats tend to be born in June and don’t leave the roost until July, if you have a bat problem in the middle of the summer, there isn’t much you can do about it. To prevent a bat family from roosting in your home in the first place, the best option is to implement bat proofing techniques in the fall and winter, after the bats have left for the season. If you have one (or a family of bats) inside your home, give us a call in Massachusetts, Maine and New Hampshire for bat control services to help you effectively and safely remove bats from inside your home. We can also offer bat proofing tips for your New England property. 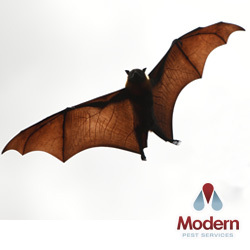 Contact Modern Pest today for more information on bat removal for your home or business.